I have been waiting to share this Kashmiri pulao recipe for quite some time now. Finally, I am posting it today for the alphabet “K” for this A-Z Biryani/Pulao series. Be it for parties or potlucks or regular dinner/lunch saga; this Kashmiri pulao will steal the show and please everyone. You can find a zillion Kashmiri pulao recipe on the internet, and now I am adding mine to that list as well. 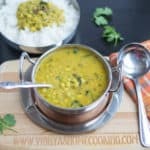 :-) After reading quite a few recipes and about Kashmiri cuisine and the spices used, I came with my version with green peas. 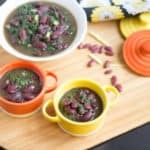 I won’t call this as a traditional or authentic recipe, but I can guarantee the deliciousness for sure. Also, some recipes don’t call for any spices but some calls for red chili powder and other spices. But I went with green chilies but included dry ginger powder along with fennel seeds. That subtle flavor of dry ginger powder adds a kick to this recipe. This pairs well with all the spicy curries. Instead of Jeera rice, try this Kashmiri Pulao, and I am sure you will love it. Like my fenugreek pulav and gongura pickle pulav, I went with rice preset for cooking this pulav recipe as well. When I make biryanis and pulavs these days, I am opting for the rice preset than the manual mode. You don’t need to check on the time nor quick release the pressure. With rice preset, I get perfectly cooked rice and no issues so far. Vegetables are not mandatory Kashmiri pulao. 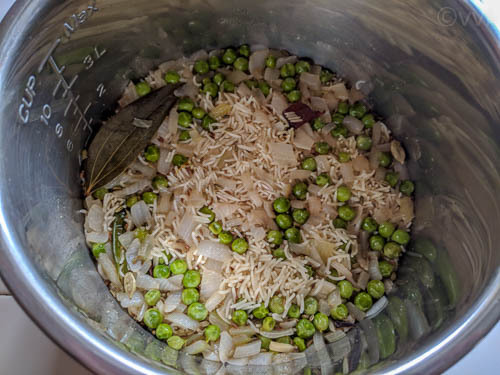 I had harvested fresh green peas from my backyard, and I felt it would go well in this pulav. 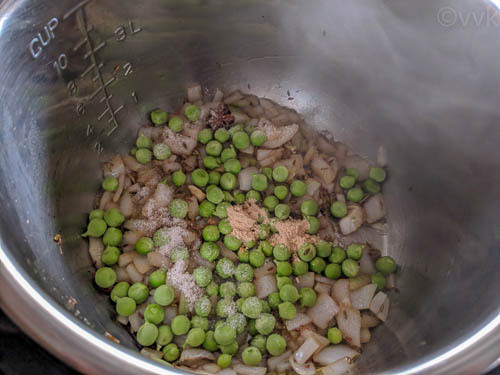 So I used 1/2 cup of peas for this recipe. You can skip vegetables or add according to your preference but do not add more than 3/4 cup. The nuts, raisins should shine in this recipe so add accordingly. Now without any delay, here is the simple yet delicious Instant Pot Kashmiri pulao recipe. Soak the saffron strands in the luke-warm milk for atleast 20 minutes. Wash and soak the basmati rice and soak it for 10 to 15 minutes and drain the water. 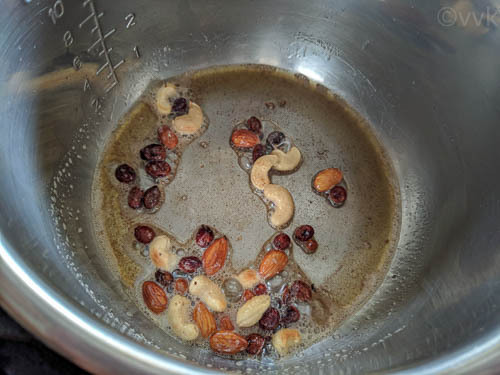 Set the Instant Pot in saute mode and when the display shows “HOT,” add 1 tbsp of ghee and let it melt and add the raisins, cashews, almonds. Saute until the raisins become plump. Remove the nuts and raisins from the Instant Pot and set it aside. Then add the remaining 1 tbsp of ghee and let it melt. 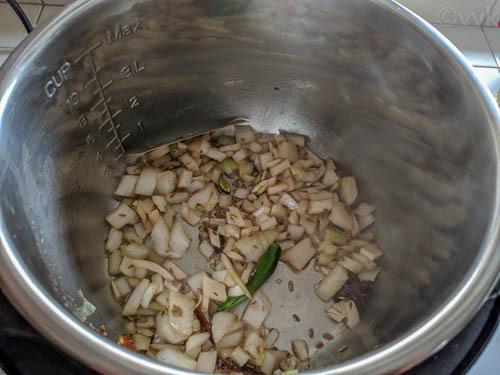 Now add the whole spices – bay leaf, cumin seeds, fennel seeds, cloves, cardamom, cinnamon and star anise — Fry for 20 seconds. Add the chopped onion and slit green chili and saute until the onion turns translucent. 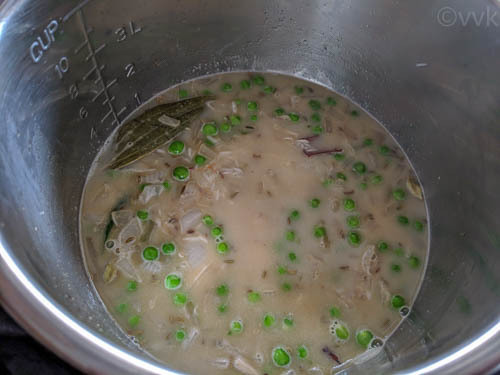 Now add the peas, salt, and dry ginger powder. Mix well. Then add the water, saffron soaked milk and drained rice. Mix gently and make sure to scrape the bottom. Carefully open the lid after releasing the pressure and allow the pulav to cool for 5 minutes. Then fluff it up with a fork. Garnish it with the reserved nuts and raisins. 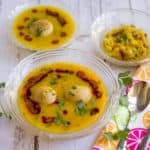 Serve hot with raita and curry. 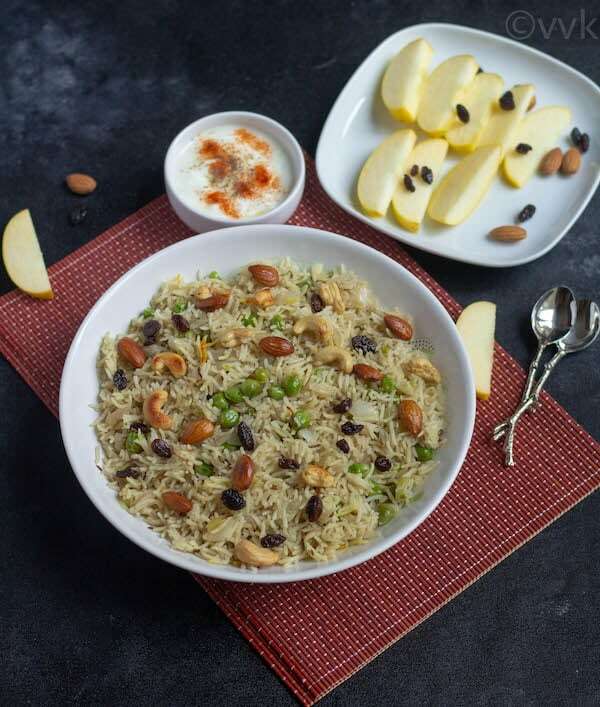 You can garnish the pulav with pomegranate arils and cut apples also. I used fresh peas. If you are using frozen, then thaw it to room temperature. You skip peas or add more vegetables. But make sure to adjust the salt and spices accordingly — no change in the cooking time if you are using finely chopped carrots and potatoes. 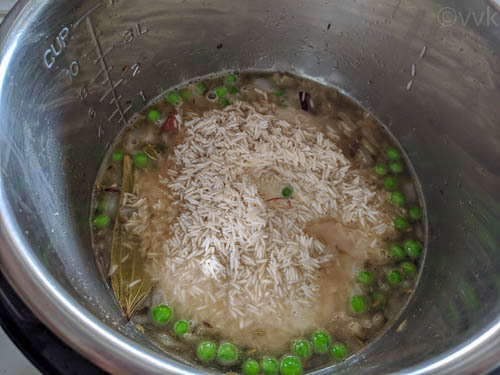 PS: If you try this Instant Pot Kashmiri pulao recipe, don’t forget to comment and rate the recipe. Also, follow my YouTube Channel for new video recipes. 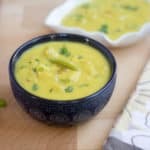 A delicious saffron-flavored mild Kashmiri pulao with peas, dry fruits, & nuts made in Instant Pot with the signature Kashmiri spices - fennel & dry ginger. 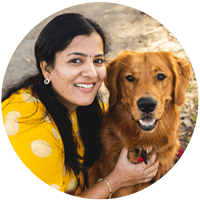 Set the Instant Pot in saute mode and when the display shows "HOT," add 1 tbsp of ghee and let it melt. 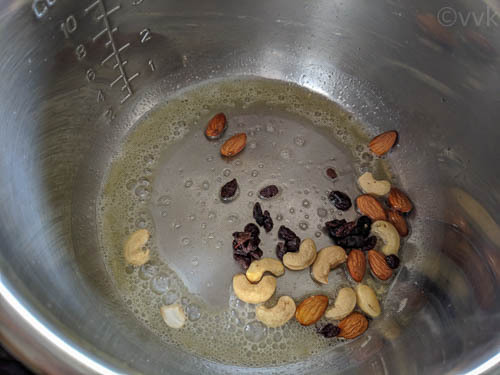 Now add the raisins, cashews, almonds and saute until the raisins become plump. 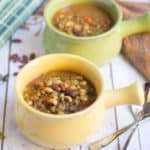 Remove the nuts and raisins from the Instant Pot and set it aside. Then add the remaining 1 tbsp of ghee and let it melt. Now add the whole spices - bay leaf, cumin seeds, fennel seeds, cloves, cardamom, cinnamon and star anise — Fry for 20 seconds. saffron takes it to another level, right ? this is such a wonderful pick for the theme ! Oh yeah absolutely. Thanks Gayathri. The pulao looks really awesome. I didn’t think that a savory dish with fruits thrown in would turn into a favorite kind until I tried it for this marathon. Same here. I was surprised for sure. Thanks :-) I am yet to read others post. 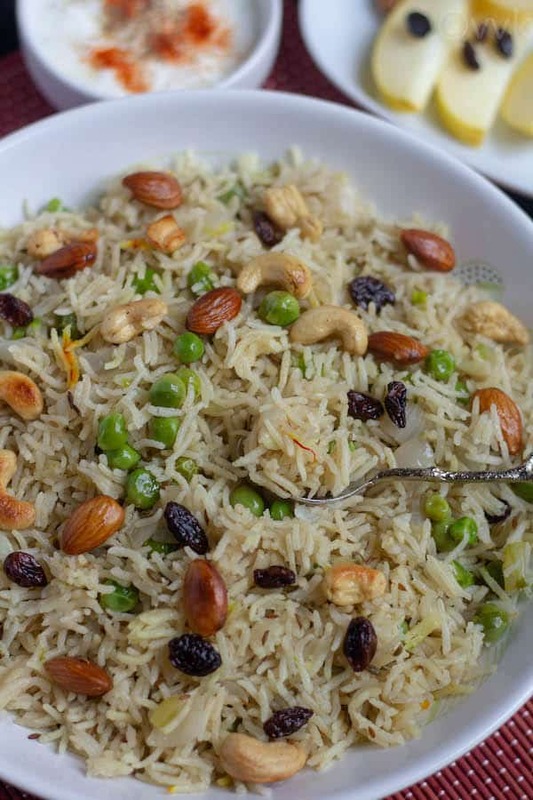 Really a quick and yummy pulao with nuts and peas.. Such my kids will love these… As they can handle mild pulao so easily!! Thanks Sharmi. Yeah, this is very mild and perfect for kids. It seems like a Kashmiri Pulao day – and every time I read one I drool . 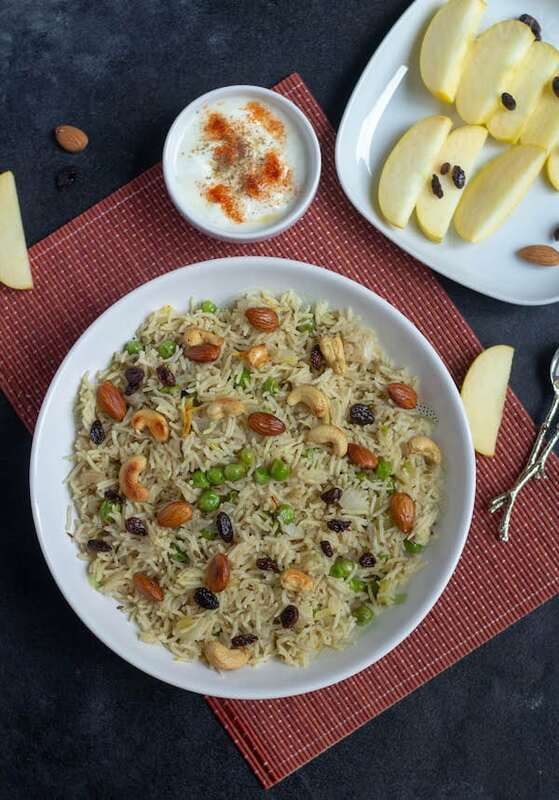 The use of fresh fruits and dry fruits and nuts makes the pulao exotic and tempting ! Thanks Vaishali. I am yet to read others. 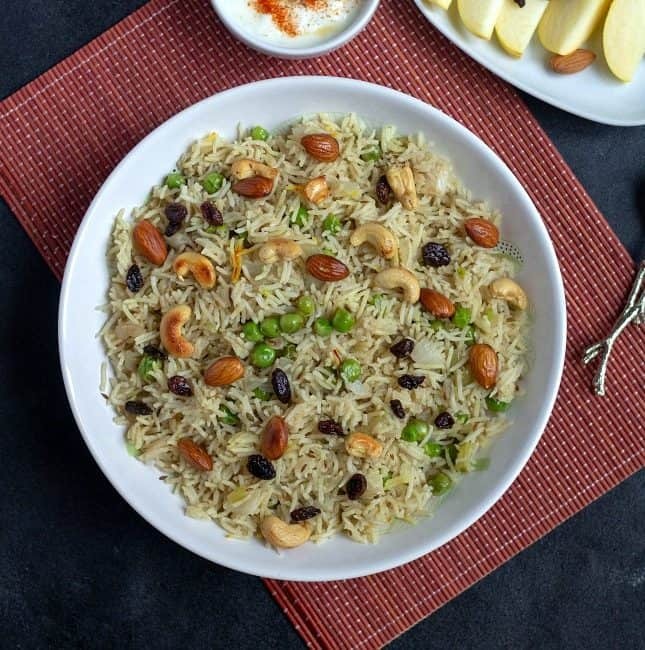 The nuts add a lot of crunch and richness to the pulao while the green peas add color. The pulao looks fabulous and must taste so yum. Kashmiri pulao looks awesome Srividhya. 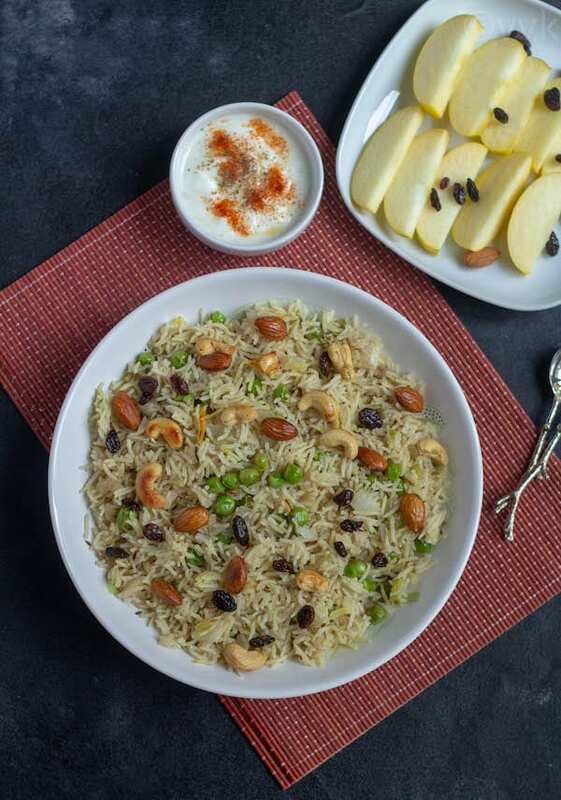 The roasted nuts on top looks amazing..I remember we used to make this pulao very frequently my years ago with apple and orange. The recipe came in the Nippo rice cooker. We stopped making it as Hubby doesn’t like sweet or fruits in rice dish. Your picture surely made me remember those days. Thanks a lot Valli. Raghav doesn’t prefer sweet and savory together as well. That’s why I did not add any apples and guess what, I had pick those raisins as well before serving him. Kashmiri peas pulao looks too good with those nuts and fresh peas. 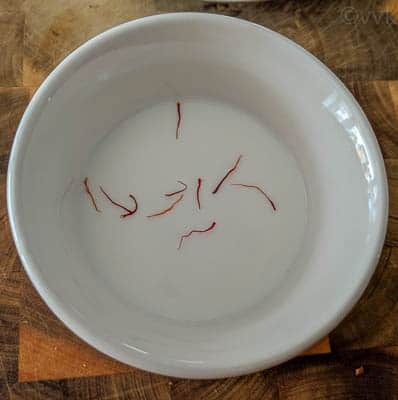 Saffron must have given nice flavor to the dish. Good one.